Should I Get Back On The Horse? Two Ways To Approach Your Fear That Won’t Work. If you get thrown off a horse, should you get back on? Some people will suggest that you need to get back on the horse immediately so that you will gain mastery over your fears. If you don’t get back on the horse, then your fear will haunt you the rest of your life. Is this really true? Here are some ways of approaching fear that isn’t very effective. The first is to fight your fears or treat the situation like a battle zone. It means taking the reins, having control of the situation, bucking up, grinning and bearing it, tightening your muscles, and powering through. It can be coercive and forceful. In some cases it means blinding yourself, dissociating or disconnecting from the fear, or minimizing or reducing the value of what your fear might be trying to tell you. Generally it is doing the thing that you are afraid of as a way to prove yourself or prove your point. The reason this doesn’t work is because it often means engaging in life as if it is a battle. Staying in the battle field often means getting hurt, risking relationships with others, being coercive, or putting the other on the defensive. Getting back on a high strung or agitated horse to gain mastery over fears is not an effective way to manage fear. The other ineffective way of handling fear is to completely avoid anything associated with the fear. This means that any mention of the feared object or situation is avoided. Conversations stop, people stop making eye contact, the air becomes stilted and stale, people avoid people, and people avoid a wide range of stimuli that becomes associated with the feared situation. The person may be humiliated that they gone thrown off a horse, so they go out of their way to hide it. While people lead perfectly fulfilled lives without riding horses, the person who can’t drive past a barn, watch a television show with a horse on it, have a conversation about what happened when they were thrown off a horse, or set foot on a farm may find themselves restricted in ways that have nothing to do with riding the horse itself. Handling fear effectively means being able to approach the situation with a flexible style that involves both challenging oneself, listening to the validity of the fear, being kind to oneself, backing off when things are too overwhelming, identifying smaller steps to approach the fear, and figuring out why the situation/ issue/ activity is important to you. Fear is a useful emotion in that it provides information about oneself and one’s situation. Fear protects us from danger, gets us out of threatening situations, and helps us cope adaptively. Fear can also be so extreme that it takes over our lives, restricts our ability to do the things that are important to us, or prevents us from having a life- the life we want. What about the situation, event, activity, or relationship is important to you? You may decide not to ride horses ever again, but does this fear bleed over into other areas of life that prevent you from doing what matters? If riding horses is not important to you, and it doesn’t get in the way of your life otherwise, it may not be an issue. What does your experience- and your fear- tell you? Your fear may be telling you that getting back on an agitated horse is indeed a bad idea. So don’t go out and get hurt if it isn’t necessary. If horses aren’t your thing, let it go and move on. Don’t let your humiliation keep you attacking something that isn’t going to service you. If you want to approach your fears, what would be the smallest step? Watching a TV show about horses, visiting a barn, feeding a horse, brushing a horse, walking a horse, and hanging out with horses are all behaviors that don’t include absolute avoidance but don’t force you into a situation that is potentially unsafe. You could also ride a smaller, more mellow horse with the help of a trainer. If you are going to do the smaller steps, don’t white knuckle it. Relax your facial muscles, soften your jaw, breath slowly/ deeply/ evenly, maintain an open body posture, and take in the situation fully. If this feels threatening, do a smaller step- or limit the time you spend doing the activity. For instance, you could watch a TV show about horses for one minute, five minutes, or fifteen minutes. If this doesn’t challenge you, up the ante by going out to a barn. Find your middle ground, back off when you are overwhelmed, give yourself credit for your efforts, treat yourself kindly, and challenge yourself at some point in the future when you are in a better place. One of the reasons mindfulness is used is to get yourself calm. If you are a person with a lot of anxiety, your anxiety might get in your way of handling problems, thinking clearly, or addressing something with your full attention. Mindfulness is one way to lower emotional arousal, center yourself, and help you get back on track. When emotional arousal returns to baseline, accessing the problem solving part of your brain becomes easier. 1) Inhale to the count of one, exhale to the count of two. Keep going until you get to the bottom of six. Start over. Do this for about three minutes. If you get lost or distracted simply start over. The point is to have something to focus your attention on; which helps cut the distractions of your mind. 2) Trace your hand. Inhale on the way to the tips of your fingers, exhale on the way to the crevice. This can be done with pen/ pencil on paper or with the finger of the opposite hand. This is a tactile way to “trace” your breath and focus your mind. Keep your attention on your breath. 3) Pause for three minutes and focus your attention entirely on sound. Try to tune in to every possible nuance of sound. See what you can hear that you typically don’t pay attention to. If your mind drifts, bring it gently back to the experience of hearing. may be what you find. Start with whatever is present in the moment. See if you can notice and allow for what is there vs. actively trying to ignore or push away. See if you can get yourself to willingly tolerate all sensations, discomfort, or urges associated with the emotion. Noticing if there is anything holding you back from doing so. Bear in mind that the better able you are to tolerate, you will be better equipped to survive the moment. Redirect your attention back to your elephant and practice the gentle yet curious gaze. Tolerating sensation does not mean that you have to approve of reality, take action, or fail to take action. 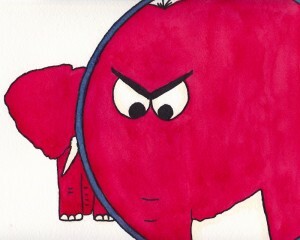 An unwillingness to tolerate what is there will not make cartoon elephants disappear. (You can’t have a life without cartoon elephants!) A refusal to tolerate can actually create more problems later. What you pay attention to= what your life is about. Do you want your entire life to be characterized by the struggle of not looking at your cartoon elephants? Get your cartoon elephants (emotions) some air! Put one hand on your stomach and one hand on your chest. When you breath deeply – into your diaphragm- the hand on your stomach will go up and down. This is one way to develop a feedback loop that will help you breathe in such a way that gets oxygen where it needs to be. Shallow breathing, hiccupy breathing, or shortness of breath can often induce panic like sensations, and can be reflected in the rise and fall of the upper chest. When you breathe, think of ways in which are simply creating space for what you feel. Counteract urges to restrict, suppress, ignore, judge, or inhibit what you feel. Breathe in, around, and through emotions. Practice gently curiosity- soften your stance and allow what’s there to be there. Try softening your facial expression to encourage and invite the process. Find a time during the day to check in with your breath. It’s often when we’re NOT paying attention to our breath that we can make the best use of this simple and accessible skill. Like cartoon elephants? Sign up for my mailing list to receive notifications on when the book is ready: The emotional extremist’s guide to handling cartoon elephants: How to solve elephantine emotional problems without getting run over, chased, flattened, squished, or abandoned by your true cartoons.